The way we conduct our entrance examinations for Year 7 entry is changing. This year we will be using BUSSATs entry tests. BUSSATs are designed to measure students’ ability in English (Comprehension and Grammar), Maths (at basic, advanced and super-advanced levels), and General Knowledge (History, Geography, Science, Current affairs and Sport). The test is delivered over two hours (with short breaks in between) using a computer-based technology platform. Pupils will also sit a separate Non-Verbal Reasoning Assessment. These assessments are intended to take place on 9th, 16th or 17th November 2018. We will be in touch with you again very soon to confirm the specific date for your child’s assessments. If your child is entitled to extra time, or special considerations, or has any Special Educational Needs, please inform us as soon as possible and supply any supporting information. There will also be a short written exercise. For those families currently living overseas, if it is unlikely that you will be able to attend the entrance exams here in the UK, please kindly inform us at your earliest opportunity. We will make a note of this and will liaise with you over the necessary arrangements for the entrance exams to be administered overseas. This may be possible at a child’s current school, at an agents’ office if appropriate and with prior agreement, or at a local British Council Office. In the Autumn term, we will request a school report from your child's current school. This school reference and report are an integral part of our assessment for each candidate as they help us get to know your child a little better and to build the wider picture of their academic and non-academic abilities and interests. We may also contact your child's current Head for more information. Music and Academic Scholarships are available for candidates entering Year 7 in September 2019. 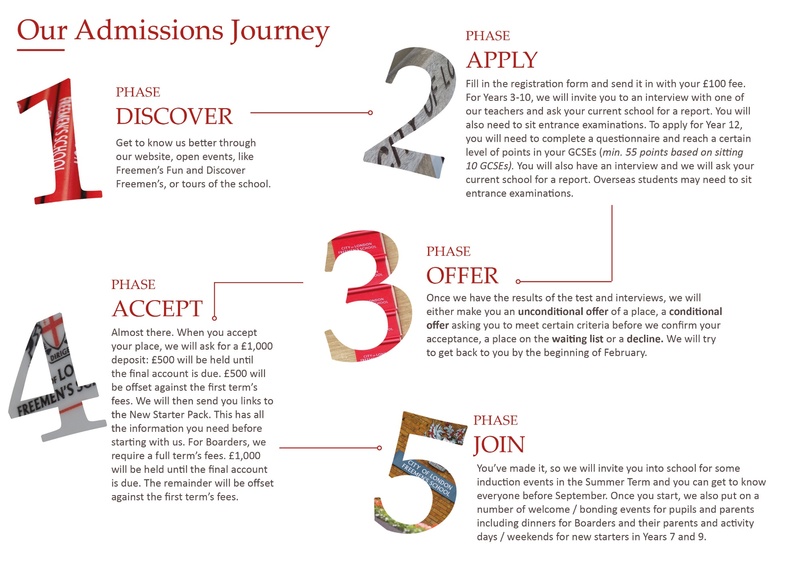 There is no separate application process for Academic Scholarships; ALL candidates for Year 7 entry will be considered on the basis of the entrance examinations, school reports and the interview following the examinations. We are open for applications for an 11+ Music Scholarship.